Admittedly the Rhymney name disappeared when the Brewery was taken over by Whitbread , but, for many , Rhymney will linger on in the memory as a reminder of the days when local workers made local brews which local people loved. Clearly ‘The Best’ was more than an advertising slogan as far as the whole South Wales area was concerned. There are today few local brewers left to give us their peculiar tang, to remind us of the days when ale didn’t taste like beer bags dipped in tepid water, like some of the drink today. Just look at the breweries Wales has lost over the last 40 years; hearing old timers talk of them is like listening to D Day Veterans recalling battle honours! Good beer was once something that really mattered in Wales. 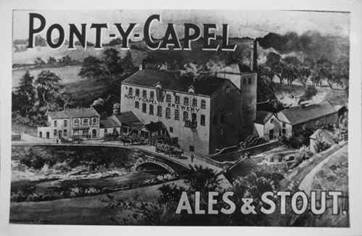 For over 140 years there was a brewery at Rhymney, a little town at the end of one of the Valleys that run north-wards from Cardiff. 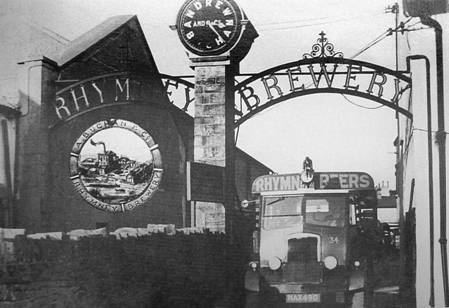 Rhymney Breweries Ltd were the largest brewery business in South Wales in the 1960s when acquired by Whitbread. 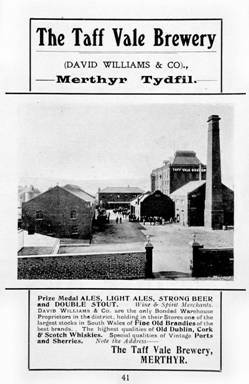 The Rhymney Brewery has its origins in the great days of the South Wales iron industry. Working in heavy industry and the hot blast furnaces certainly gave the men a terrible thirst! It should be noted that it was no joke but absolute fact that in mid nineteenth century industrial Wales it was far safer to drink the beer than to touch the water, as many victims of cholera found to their cost. Many licensed houses at this time had their own brew house from which they obtained their own supply of ale. 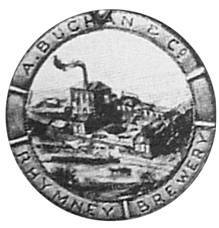 The Rhymney Brewery began operating in 1839 with Andrew Buchan as its manager. 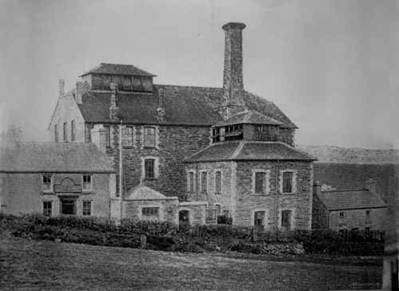 In 1858 a directory for South Wales noted “brewing is carried on to a considerable extent by Andrew Buchan & Co at Rhymney, where the Brewery is considered the largest in South Wales”. Andrew Buchan was noted for his love of children and he financed annual treats for schoolchildren. According to his obituary, “If he saw a small boy with a shabby cap he would toss it over a hedge and then take the boy to his Shop and give him a new one-with a bag of biscuits also”. 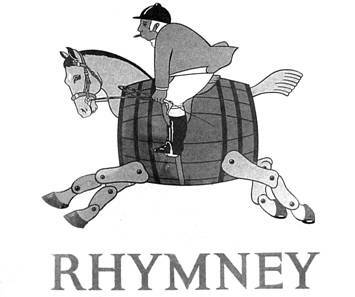 By 1878 the Brewery called Rhymney Brewery and Co. Ltd. delivered 12,500 barrels a year to its 29 tied houses and also other public houses. At the National Brewers’ Exhibition in 1888 in London, the firm was awarded a silver medal for its Old Beer and a bronze medal for its Stout. Beers produced at the beginning of the twentieth century included King’s Ale, “The Wine of the Valleys”, which was introduced in 1902 to mark the coronation of Edward VII. The long list of beers include: - Empire, GHB, BB, IPA and Stingo in Draught, and Light Ale, Empire Special, Cream Stout and Family Stout in bottle. The famous Hobby Horse trademark of the little man on the barrel, designed by a keen sportsman became well known familiar sight throughout Wales and especially the Valleys. “Where the Hobby Horse Roams” became the phrase used to describe the extent of the Buchan estate. Other slogans over the years included, “The True Brew- always in Good Condition”. There was the Cyfarthfa Brewery at the top of Nantygwenith Street, a street that had 13 pubs on the way to the Cyfarthfa Works. This was what is known as a tower brewery, a substantial construction of quarry stone five stories high. The plant had several vats holding 40 barrels each. Owned by D. T. Braddick who lived at Penydarren End House near the Theatre Royal, the business closed down in 1920. 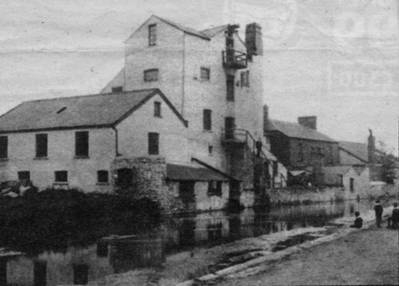 Another Brewery was Meredith’s Brewery, operating in Lower Vaynor Road behind the Rising Sun at the Stocks, Cefn Coed. 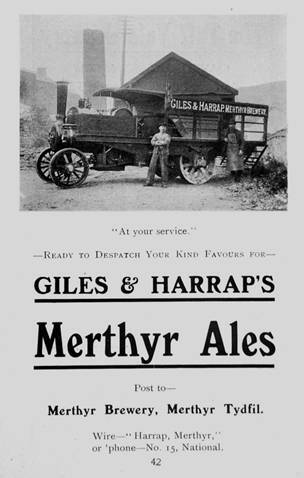 The Giles and Harrap Company of the Brewery Vaults in Brecon Road, also known as ‘the Merthyr Brewery’ was the oldest established business in the district. In addition to the brewing business, the firm carried on a large trade in wines and spirits. The Red Dragon brand of wines and spirits were bottled here and the special ‘F.O.H.’ Fine Highland Blend Scotch Whisky was an important feature in the business. It was a progressive firm up until the time of the depression of 1935. It operated more public houses than even Andrew Buchan’s (Rhymney) or the Pontycapel Brewery of Cefn Coed. There was a lot of money to be made in the brewing industry. Jimmy Harrap, the last surviving partner, provided Harrap’s Park at the top end of the Walk, Merthyr Tydfil, for employees and tenants. When the depression hit the town very seriously in the thirties, the level of unemployed being well over 70 percent meant that few could indulge in the luxury of a pint after work, unfortunately not many men were actually working! It must be said that the most popular beer sold was quite low in alcohol and what is now sold as ‘mild’. 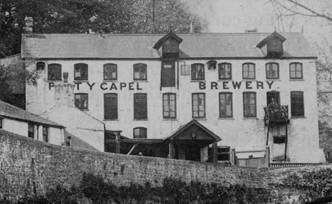 There was once a Brewery in old Caedraw and also one in the Clarence Hotel, Dowlais, kept by D.W. Huggins. Most of these smaller breweries had a brew capacity of about 30 barrels. 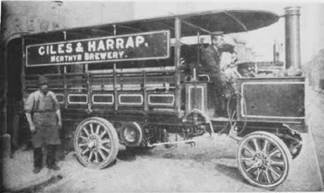 When times became really bad, Harraps sold out to William Hancock and Co., who ceased brewing in Merthyr, using the premises merely as a depot. 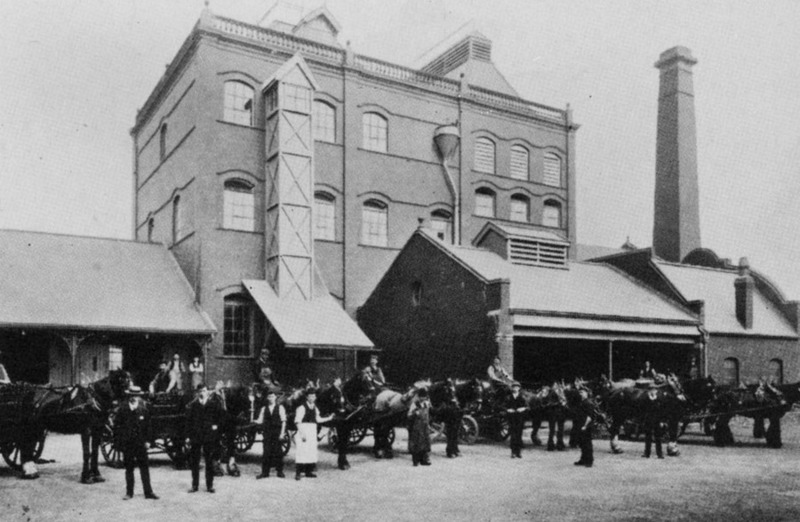 At one time all beer was delivered by horse-drawn carriages. It was taken over by Harraps and then operated by Walker’s of Cefn Coed, who also had the Angel Hotel at the bottom of town. 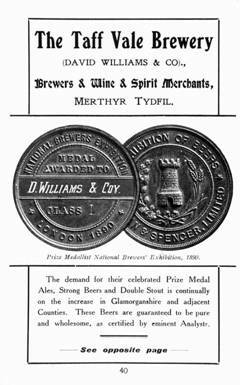 One of the man rivals of Rhymney Breweries was D. Williams & Co., (Merthyr ) Ltd. Only a few miles apart the two breweries enjoyed a friendly rivalry for many years. moved to completely new premises on the hill above the Penydarren Road in 1904. 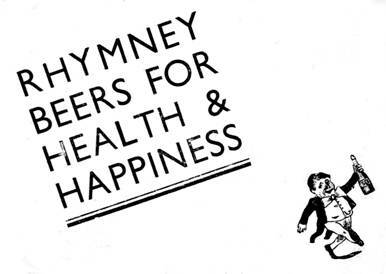 Eventually the Rhymney Brewery was taken over by Whitbread in The final closure of Rhymney Brewery came on April 27 1978, a sad day for all concerned. In the 140 years since Andrew Buchan had first built the Brewery, it had improved out of all recognition.